Pictured L-R: Robert Toms (ESPN), Michael "Spike" Szykowny (Habana Avenue), Lucas Nickerson (Habana Avenue), Steven J. Levy (Habana Avenue), Ken Levitan (Vector Management), Brian Kelley (Florida Georgia Line), Hank Williams Jr., Jason Derulo, Frank Harris (23 Management), Kirt Webster (Webster Public Relations), Tyler Hubbard (Florida Georgia Line), Seth England (Big Loud Mountain). NASHVILLE, Tenn. – ESPN’s Monday Night Football will feature the return of its iconic anthem this fall when legendary country singer Hank Williams Jr. kicks off the weekly Monday primetime game by asking NFL fans: “Are You Ready for Some Football?” Every Monday night during the 2017 NFL season, Williams will perform his hit song “All My Rowdy Friends Are Coming Over Monday Night” with superstar duo Florida Georgia Line and multi-platinum recording artist Jason Derulo. Williams returns to MNF for the first time since 2011 to perform the show’s opening anthem for an unprecedented 24th season, a ritual that has earned him four Emmy awards (1991-1994) and national acclaim among legions of football fans. 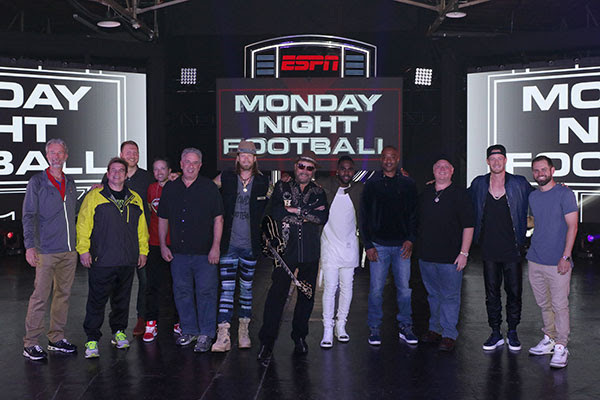 Florida Georgia Line and Derulo will be appearing in the MNF video for the first time. The MNF kickoff video features team-specific lyrics and visuals each week based on the 17 regular-season ESPN matchups. All three artists recorded audio tracks in May. They filmed the opening video together June 4 at the Marathon Music Works in Nashville. Ricky Reed (Nice Life Recording Company), a 2016 Grammy Award nominee for Producer of the Year, is the music director. Mike “Spike” Szykowny (producer) and co-directors Lucas Nickerson and Chris Mantzaris of ESPN Creative Services are overseeing production of the video with MNF producer Jay Rothman and Vice President, Creative and Studio Direction, Bob Toms. Habana Avenue produced the video shoot. "This is a huge honor to be a part of such a legendary song and night!" said Florida Georgia Line’s Tyler Hubbard. FGL’s Brian Kelley added: "We all grew up watching Monday Night Football and it's surreal to join Jason Derulo and Hank Williams Jr. on this new version that gives a nod back but also a step forward!" Monday Night Football’s 48th season kicks off with an ESPN doubleheader on Monday, Sept. 11 – New Orleans Saints at Minnesota Vikings (6:55 p.m. ET) and Los Angeles Chargers at Denver Broncos (10:15 p.m.).